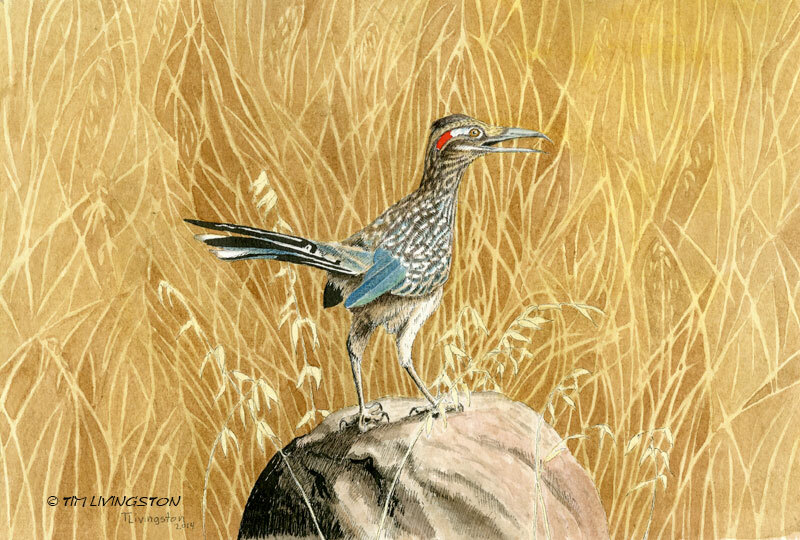 This entry was posted in Drawing, Pen and Ink, Watercolors, Watercolour, Wildlife and tagged art, drawing, Forester Artist, pen, pen and ink, roadrunner, watercolor, watercolour by foresterartist. Bookmark the permalink. great painting, the bird looks so cheerful, I even like the background! Thank Annerose! I think it was panting because it was a hot day and it had been running. oops, panting is not really smiling! But it’s beautiful. I looked up their range. What’s funny is that right here in Shasta County is the most northern extent of their range. It can reach 115 F degrees here in the summer. I think they must like the heat, because no matter were they live it’s hotter than heck. Watch out for that anvil!!! Don’t fall off that cliff!!! Thank you Anna! I think roadrunners are cool. I can’t think of another bird that runs like a roadrunner. Always imagine them as a much larger bird wonder why 🙂 … That’s a super watercolour of the bird Tim , the background is a perfect foil to your RRunner too ! Thank you Poppy. roadrunner was always tall in the show. What a treat! I think this must be lookout roadrunner. He looks like he could be part of a monument statue, perched on that rock. What a great photo and watercolor. Thanks for sharing. Great painting. Lovely combination of watercolour, pen and ink. The bird, rock and background are all rendered marvellously. Wonderful! I also love the background very much. It has in itself such a nice pattern and I find my eyes wandering about among the lines, in all directions! What a treat, thanks! I’m so glad you like it Gunilla! You outdid yourself this time! I seriously thought the pen and ink was the photo! Great job. Beepbeep! Beautiful painting and photo too! Wonderful! The realistically rendered bird stands out beautifully against the stylized background. Beautiful. Thank You Teresa! I’m happy you like it. Hey Tim, my pleasure! I’ll take your challenge and draw a roadrunner. I think this dates us…..road runner….wiley, bugs bunny,….lovely painting! So true Rebecca. Thank you! Wow, I love your painting! The background is wonderful, it´s really unique! Beautiful. Perfect amount of detail in the background..giving interest without overpowering. Love the color palette as well. Great job! I love that brown of the grass too. So apt for this time of year in this region. Lovely bird! Normally, our grasses would be lush right now. The green is quickly fleeing the hills early this year. I do love to see the roadrunners, always a treat. Great painting, so nice to see a real roadrunner. Thanks Karen. I see them so infrequently that it’s neat when I do, but it’s an event to get a picture. They usually run away. Go figure! Awesome painting Tim – love the detailed feathers. Roadrunners are such curious creatures. You did a beautiful job of this! Thank you Teresa! I can’t think of another bird quite like a roadrunner. They are unique. A wild turkey is about the closest and they aren’t that close. The detail in your painting is awesome. I’ve never seen a roadrunner; they must also like warmer temps thn in Montana. Thank you Jill! Alas, no they don’t go that far north. They probably ran away one winter and never came back. Cute bird and painting. I noticed yours had a red spot on the head and the photo didn’t. Do they vary or is it sexual dimorphism? Actually the bird in the photo did have the red. You just can’t see it well. The reference photo displayed it nicely, but it wasn’t very sharp. I think both sexes are the same. This is a very beautiful painting/drawing. I am really drawn to the small amount of red. Thank you for liking my scratchboard “On Vacation”. I have just started drawing birds, before this mostly dogs and cats of the pet variety. It is quite interesting that we seem to have a few coyotes running around New York City this week. Not a very usual occurrence. I keep hearing of the coyotes in NY. That surprises me, but why not. Coyotes are very resourceful. Out here their numbers are increasing, and that is probably true there too.